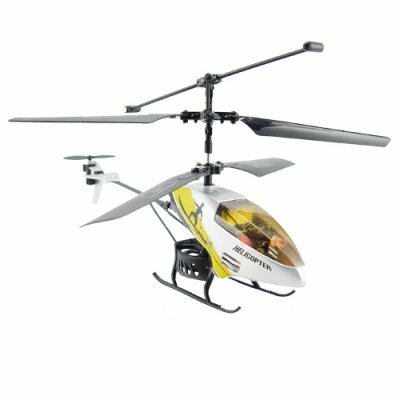 Successfully Added RC Mini Helicopter with 3 Channel Remote Controller (110V) to your Shopping Cart. RC mini helicopter with 3 channel remote controller. This radio controlled mini helicopter is a lightweight helicopter made of tough durable aluminium and molded plastic and comes with an advanced RC controller. This fun sized mini chopper has twin rotor blades, one tail blade and stabilizer bar for smooth control of this mini sized unit. This is an RC mini helicopter that people of all ages will enjoy from the comfort of their living room. Fly and land the helicopter in any direction you want with the 3 channel remoter controller. Let it hover in mid air, turn left or right. It comes with an independent tail blade for improved forward/backward flight control, and one of the longest flight times you can get from a battery powered mini helicopter. The helicopter cockpit has a multi colored LED light bulb on the inside. Once you switch on the power ON button, you get a nice array of multi-colors lights emanating from within. This makes a brilliant birthday or Christmas gift, or just a nice present for your child or favorite nephew. As always, this wonderful product is offered to you at a low wholesale price. From the leader in unique direct from China electronic products, Chinavasion. 3 channel RC mini helicopter. Great flight controls for a mini sized copter. Multi-colored LED's to add to the fun. Why does the remote have 3 channels, what are they for? The 3 channel function means that you and your friends can operate your helicopters at the same time. Your friend can fly one on channel A, your other friend on channel B, and you on channel C. Nothing is more fun than flying together with friends!